As another football season is upon us ECDSA has a question for you: do you or anyone you know have a disability that affects your / their match day experience at our football club? If so we would like to hear from you. ECDSA was formed in 2007 with aims to promote activities and schemes for the benefit of Exeter City AFC Ltd and its disabled supporters as well as those with impairments and those of the disabled supporters’ personal assistants. Through our membership and various fund raising initiatives ECDSA has raised over £21,000 to help improve the match day experience for home and away fans during their visit to St James Park as well as helping other disability groups. 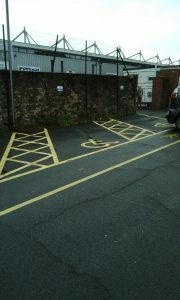 For example last season ECDSA worked closely with the newly appointed ECFC Stadium Manager, Mark Latham, on various issues including accessible parking and improving the facilities in accessible toilets including the installation of a new radar key locking system for the accessible toilet in the upstairs of the IP Office Stand. ECDSA has also been working closely with the club regarding the redevelopment of St James Park. These are just some examples of the many things ECDSA is doing and has achieved over the past 10 years. ECDSA would like to see its membership reach the 100 mark this season and there is no better time, than at the beginning of a new campaign, to join ECDSA. We welcome all supporters; you don’t have to have a disability to join us. So if you have an interest in helping us improve the match day experience of both home and away fans with disabilities or would just like to join us then we would like to hear from you. Membership is just £5.00 per person per season. ECDSA members are included in the Exeter City FC priority group ticket database and you get a membership card and a limited edition pin badge. Application forms to become a member of ECDSA can be downloaded from Join Us or are available at the Club reception. You too can play a small part in helping others – join ECDSA today. Exeter City Football Club again very kindly give us a bucket collection which took place at the Accrington Stanley match on Sat 25th November. We raised a fair amount of £244.92 😀 which will be spent very wisely by the association as is always the case. A big thank you to all our members who helped and gave up their half-time for ECDSA and thank you to our football club for giving us the opportunity to have a match day collection. Also a big thank you to all city fans who kindly put their hands in their pockets and gave so generously. 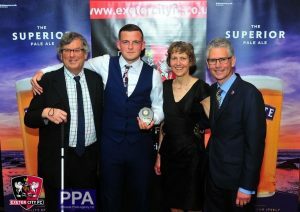 Exeter City Disabled Supporters Association ‘Most Improved Player of the Year’ award 2017/18 was presented to this years winner by ECDSA committee members Trevor and Sue Harwood and award sponsor & former committee member Steve Gazzard at the clubs end of season ball. George Friend; Dean Moxey; Liam Sercombe; James Dunne; Scot Bennet; Artur Krysiak; Tom Nichols; Jordan Moore-Taylor; Ollie Watkins and last year’s winner was Christy Pym. Andrew Barge sadly resigned as our chairman at the end of March. 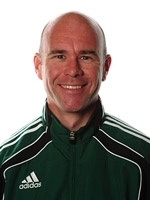 Ambassador: Former England Premier League & FIFA Assistant Referee Mike Mullarkey continued as our ambassador. However, due to work commitments he has decided to stand down as our Ambassador as of this AGM. The following is a statement we received by Mike on his decision. After much consideration, I feel it appropriate that I stand down from my role as Ambassador for the Exeter City Disabled Supporters Association at the forthcoming AGM. I have thoroughly enjoyed my involvement since taking up the position in 2014, however, in the last 18 months since taking up my role Coaching the Assistant Referees within PGMOL I have found it increasingly difficult to attend Association meetings and functions. It is only right that the Ambassador is able to give sufficient support and presence to the group as this is the primary reason for my decision. I do feel that my profile within the game is now much lower than when I was active and I feel that a new Ambassador would be able to bring greater spotlight on the Association which can only be a positive thing. I would like to thank everyone for the warm way in which I was greeted from my first meeting and every subsequent involvement. I would like to stay in touch with the group and will continue to stay on as a member. Many thanks for your support and best wishes for the future. Mike Mullarkey. President: Lee Holmes continued as our President for a second season and we had the pleasure in sponsoring Lee’s training kit. Thank you, Lee for your fantastic support and being the President of our association. Windbreaker board: We continued sponsorship of our board at the front of area 2 in the Main Stand. Match day accessible parking: Due to redevelopments we lost 3 accessible parking places as we had 6 before so we had to suspend the waiting list we hold on behalf of the football club that ensured all spaces are used on match days by those with disabilities only. We are working with the football club to ensure we get these lost spaces back and we hope this will be fulfilled shortly. Level Playing Field membership: We continued to be fully paid up members and this ensured we get any legal advice and support if needed on any accessible issues. Re-development: Our representatives, Jeanne; David and Nick have had further meetings with Justin Quick (club’s General Manager) and been working on the concerns we had with the plans and with Justin’s help and understanding, our concerns are continuing to be rectified as we continue to keep an eye on things and we look forward to seeing the changes we’ve asked for and within the redevelopments limited budget. Accessible Information Leaflet: A new and improved accessible information leaflet was put together which includes our membership form. This has been updated for the new season and copies will be printed shortly. Large cheque for presentations: Signs Express as one of our partners kindly donated a large laminated cheque for us to use when doing cheque presentations. Thank you. Bucket collection: The football club again kindly gave us the opportunity to have a bucket collection which this time was the Accrington Stanley game held on 25th November. A big thank you to all our bucket collectors for giving up their half-time. New dugout issue: Last summer new dugouts where put in front of the IP Office Stand near the touchline, however, these made visibility of the game for users of accessible areas 2 and 3 very difficult. The positioning of the dugout severely restricted the view of one half of the pitch and make it impossible to enjoy the match. Nick as the clubs DLO was able to get users of areas 2 & 3 a refund on their season tickets with Justin Quick’s understanding and a ‘good will gesture’ by the football club. Justin Quick attended one of our meeting and reported that the dugouts were not satisfactory for the spectators or the team and he has requested an architect draw up some plans to resolve this issue. It maybe that the dugouts could be swapped for the accessible bays but access could be a problem. Yeovil DSA: Sadly, Bruce James and Roger Battrick both ex-chairman of Yeovil’s DSA passed away and we sent them a condolence card as we’ve got good ties with their DSA. Disability Workshop: We were invited by Martin Weiler and Will Barrett who were hosting a workshop on the topic of ‘Disability and Football’. The aim of the workshop was to discuss on how football clubs engage with people with various disabilities, and how this has changed and developed over time and the purpose of the event was to draw together some of the most important elements of the discussion to form the basis of a short film for the heritage lottery funded, ‘City Museum’ project. Most Improved Player award 2017/18: Members were asked again to vote for their ‘Most improved player of the year’ and this year’s winner was Pierce Sweeney. The trophy was presented to Pierce by committee members Trevor & Sue and our trophy sponsor Steve Gazzard at the club’s end of season ball. We continue having ties with other supporter groups namely: ‘One game, one community’ group; East Devon Grecians who continued their support with our group by continuing their membership with us. Also, the Supporters Trust and the Football Club. Membership was lower than last season and we’ve still got high hopes on having over 100 members. One thing we could do is by looking at our followers on Facebook as we’ve 75 followers, which is higher than our membership, so it’s now finding a way to encourage the followers who aren’t members to become members. Our association is still supportive of the South West Disabled Fans’ Experience Forum as founder members with last year’s forum taking place at Yeovil Town. Committee members Sue and Trevor attended last October’s forum along with Richard Knight the club’s Supporter’s Liaison Officer. The forum was again a great success and the next forum will be taking place at Bristol Rovers, this October. I would like to finish by thanking the committee including Andrew for all their hard work and time given for the benefit of our members and Exeter City over the past season. Our partners, Exeter Nissan; GreenMyBusiness and Signs Express for their support. Mike Mullarkey and Lee Holmes for their fantastic support of our association and to all our members for their continued support and to Exeter City Football Club for allowing us to use their facilities, again for free for our meetings and finally to you all again for attending this year’s AGM.